UPDATE (2:27 PM MDT) : The sheriff has announced the recovery of the 2-year-old boy’s body who was killed by an alligator at Disney World. 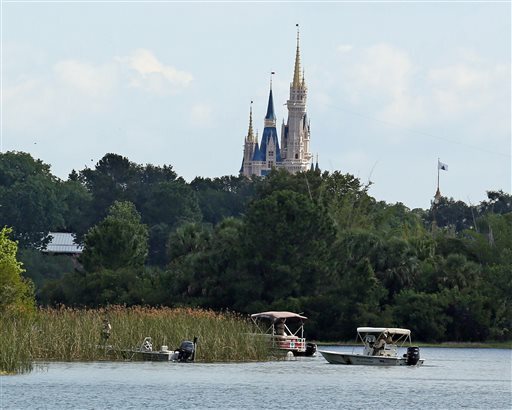 LAKE BUENA VISTA, Fla. (AP) — Walt Disney World closed beaches at its Florida resorts Wednesday while dozens of rescuers searched a lagoon for a 2-year-old boy who was presumed dead after being snatched off the shore and dragged underwater by an alligator. Wildlife officials removed five alligators from the water and cut them open but found no sign of the child. Authorities planned to keep looking for the boy. “We’re going to be here throughout,” Sheriff Jerry Demings said. Wildlife officials said the attack was a rarity in a state with a gator population estimated at 1 million. But it still spooked visitors in a city built on tourism. “We have been to Yellowstone and encountered grizzly bears, but this is just freaky,” said Minnesota tourist John Aho, who was staying at the park with his wife, Kim, and their 12-year-old son, Johnny. 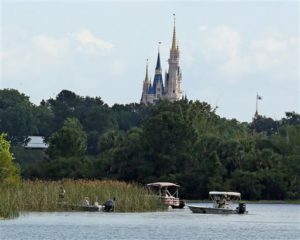 The child had waded no more than 1 or 2 feet into the water of the Seven Seas Lagoon around nightfall Tuesday when he was taken from a small beach, authorities said. The Nebraska family of four was on vacation at a Disney World resort. The boy’s father desperately tried to fight off the gator, suffering lacerations on a hand, but he could not save his son. Neither could a nearby lifeguard, officials said. “No swimming” signs were posted at the beach, but the child was wading, not swimming, said Jeff Williamson, a spokesman for the Orange County Sheriff’s Department. Demings said there have been no other alligator attacks on the lake. Some visitors were surprised to learn the reptiles lived on the property. “My question is why are there alligators in there?” said Michelle Stone, who lives near Detroit and was visiting Disney for 10 days with her two children. Nick Wiley with the Florida Fish and Wildlife Conservation Commission said witnesses estimated that the alligator was 4 feet- to 7-feet long. The beach where the reptile grabbed the child is part of the luxury Grand Floridian resort, across the lake from Disney’s Magic Kingdom theme park. The man-made lake stretches over about 200 acres and reaches a depth of 14 feet. It feeds into a series of canals that wind through the entire Disney property. More than 50 law enforcement personnel searched the well-tended lagoon along with an alligator tracker and marine units equipped with sonar to search the lake’s sandy, mostly flat bottom. Divers were standing by. Though Florida has grown to the nation’s third-most populous state, fatal alligator attacks remain rare. Since 1973, 23 people have been killed by wild alligators in Florida, according to data compiled by the Florida Fish and Wildlife Conservation Commission. Those fatalities were among 383 unprovoked bites not caused by someone handling or intentionally harassing an alligator. Eight children, ranging in age from 2 to 16, were among the fatalities. Five died while swimming in lakes, rivers and canals. The youngest victims were killed near lakes, including a 2-year-old girl who wandered 700 feet from her fenced backyard and a 3-year-old boy who left a roped-off swimming area in a county park to pick lily pads. The grim news was only the latest for a city buffeted by tragedy in the past few days. On Sunday, a gunman opened fire at a gay nightclub in Orlando, leaving 49 people dead in the worst mass shooting in modern U.S. history. On Friday night, Christina Grimmie, 22, a contestant on season six of “The Voice,” was fatally shot as she signed autographs after a show in Orlando. Associated Press writers Joshua Replogle in Lake Buena Vista, Florida, and Freida Frisaro and Jennifer Kay in Miami contributed to this report. My heart breaks for the parents. I can’t imagine the trauma. I hope they don’t blame or hate God but instead draw nearer to God. well, that might be the end of gators in FL. They’ll have to kill several thousand to teach them a lesson. Ladybug. .I don’t think the tree hugging turtle people would let that happen ! Don’t worry Bob. There’s 5 million alligators in the southeastern U.S., including 1.25 million in Florida, so they aren’t going to become extinct anytime some. Ladybug. ..the only sign there is a no swimming sign. That is certainly not the same warning as watch out for alligators! The boy wasn’t swimming but I guarantee they wouldn’t have been relaxing if there was an alligator warning sign. Although I am sorry for this families terrible loss I cant help but point out and remind people. The alligators were here first. Everywhere you go there will be some natural animal like threat. You can not pretend it does not exist or can not happen to you.